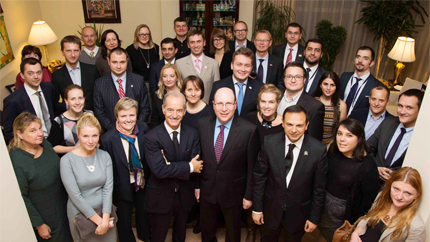 On October 16th, 2015, the U.S.-LT Alumni Association organized and hosted the 7th European Network of American Alumni Associations (ENAM) conference, titled “The Borderline between Cybersecurity and Individual Freedoms,” at Kempinski Hotel in Vilnius. ENAM alumni from Germany, Poland, Netherlands, Italy, Estonia, Ireland, Hungary, Georgia, Romania, Montenegro, Russia, Ukraine, Azerbaijan along with Lithuanian professionals working in the fields of law, IT, finance, business, academia, and politicians and senior civil servants gathered to discuss important cybersecurity challenges and ideas on how to make cyberspace resilient for businesses, individuals and governments across borders. In all, 180 people attended the conference. Lithuanian President Grybauskaitė was the patron of the conference and her welcome speech was delivered by her advisor Vilmantas Vitkauskas. Howard T. Solomon, Deputy Chief of Mission, U.S. Embassy Vilnius, Massimo Cugusi, Secretary General of the ENAM, and Danguole Kiznienė, President of the US-LT Alumni Association—all addressed the audience with short remarks. EU Keynote speaker Giovanni Buttarelli, European Data Protection Supervisor, raised awareness about new developments in the field of cybersecurity in the regulatory framework in Europe. “There is no security without freedom,” he said, emphasizing that EU should open a new chapter for data protection. Mr. Buttarelli also highlighted the importance of safeguarding individual privacy and inspired a significant discussion among conference panelists and participants about the role of human dignity in data protection. Both speakers stressed the need for a broader discussion, in the EU, U.S. and globally on how to ensure the integrity of our individual rights and freedoms while embracing the benefits of new technologies. Conference moderator, TV journalist and writer Andrius Tapinas, engaged the first group of panelists - members of Human Rights Monitoring Institute, Criminal Police Bureau, SORAINEN Law Firm, Ministry of National Defense, International Security Cluster to discuss the topic “Privacy in the cyber-age: myths and reality.” The second panel featured expert representatives of the Ministry of Security and Justice of the Netherlands, TEO Telecommunications Company, Delfi internet portal, International Security Cluster, INFOBALT Association, who debated the resiliency of cyberspace – imperatives and challenges for businesses, individuals and governments. The conference was supported by the U.S. Embassy Vilnius.